Julius, Momma will always love you. Here or not. I was in fourth grade when I took Julius into my arms and claimed him as my own. In reality, he claimed me as his. Julius was a very large cat at about 20 pounds when I got him. He wasn't really "fat" as much as he was tall. 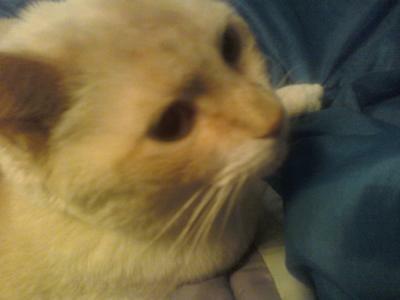 Julius was a flame point Siamese with a Ginormous Heart. He was the definition of a gentle giant and never had an aggressive bone in his body. He was always a pacifist. I loved him just as much as he loved me. We grew up together. I remember being with him every day I was home. Holding him. Playing with him with his toy mice and feather sticks. I would go to bed at night and sometimes wake up with no covers on me. I would reach down to pull them on top and as soon as I would tug to bring them up, they would go farther down. Julius would always drag them away. 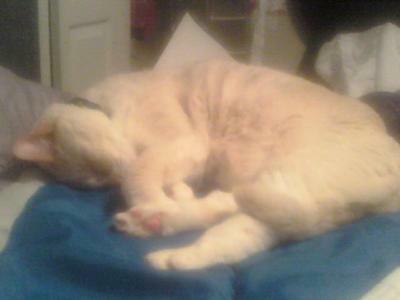 Other nights, I would wake up with him pouncing on my feet and pawing at them. One day, I sat at the dinner table and dropped my napkin. I caught it just before it fell to the floor and Julius ran out and snatched it from me. I didn't see him for the rest of the night. The next morning I woke up and my napkin was resting on my face, with Julius knocking it around. The next day I woke up with a huge spider, just big enough to fit in the palm of my hand, crushed up and dead on my pillow with Julius sitting next to it, staring at me. One morning at 4 a.m. I woke up to finish a project outside. I opened the door and didn't realize that a mother bird had flown in. A few minutes later, my brother came running down stairs yelling that there was a bird in the house. I heard crashing in the bathroom and immediately ran upstairs. I went up the stairs as fast as I could! Julius came prancing down the stairs and dropped the bird at my feet. I picked it up and he looked up at me with the biggest blue eyes as though saying "Momma? Can I has it?" I took the bird outside and let her go. She had fledglings in the nest on the porch. That whole morning, Julius followed me around the house trying to get something out of my hand, even though there was nothing there. My boyfriend (who is now my husband) would call my cellphone, and, every time he did so, Julius would stop whatever it was he was doing, run into my bedroom and sit next to me, meowing at the phone until he said hi. He only did it when my husband called and always did it every time he called. Julius did some pretty funny and loving things and he was always there for me. He cared about me when I was sick and wouldn't leave my side unless he had to eat or use the litter box. He was like a guardian angel in feline form. He took my heart and made it whole. I love him for it and everything he has ever done. I will always remember him. This lovely story left me with tears in my eyes. Thank you so much, Megan, for sharing your memories of Julius with us. You were a good owner. Julius was a lucky cat to get a human like you! It's hard to say goodbye to our cats who are also family members and friends. Be comforted that he had a great life and brought you much joy! Thank you, Megan G. for the empathetic words. Julius meant a lot to me. I'm very sure Mo meant alike to you as well. There are so many things I regret and can not get over. But not being able to be there for Julius during his last few months of life, are the worse of them all. I really enjoyed your story. Your Julius reminds me of my cat Mo, that I lost last February. 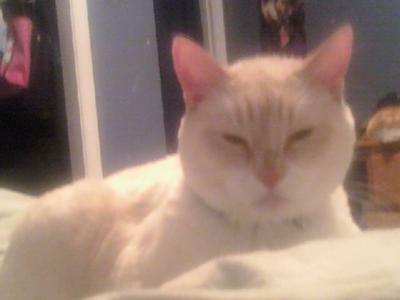 A friend told me she had to give up her cat and, knowing I was a Siamese lover, told me he was a flame point Siamese. In reality I ended up with a very fat orange cat (who looked like maybe, somewhere very far down the line, he might have Siamese blood). Julius and Mo looked almost identical, and the gentle giant is a perfect description. I'm sorry for your loss. I know how terrible it feels.